Let's talk about what makes a good helmet. This is something that I've discussed elsewhere but never in detail here on my blog. The topic comes up time and time again and it always surprises me how little people seem to know (or care) about what they use to protect their head. When I started paddling I did a fair amount of research to educate myself. I'll share my findings and developed beliefs to try to make things easy for folks. A quick note about design: if you're more worried about how it looks, then maybe you should find another sport. Yes, there's fashion in kayaking. But it should always come after function, especially when the function is safety. To a certain extent, the most important thing is that the helmet fits. If it doesn't, it won't stay on when it's needed or the owner won't want to wear it in the first place. Make sure it's comfortable. Take your time to outfit it well. Add some fit pads so it comfortably touches in many spots Adjust the chin strap so it's tight - it should make chewing a challenge. When you shake your head no the helmet should move with your head, when you push on the brim it shouldn't lift off your forehead. It should come down low enough to cover your temples and your occipital lobe (lower back of skull). You can't tell how a helmet will fit and what it will cover without trying it on. Some small looking helmets actually cover the important areas. Some large helmets might still sit too high on the head and leave your forehead exposed. Try it on, look in the mirror, get a friend to tell you how it sits in the back. There's no other way than trying and I often take up to an hour to adjust and pad out a new helmet. After the fit, the most important thing is the foam. Lots of people want to know what the shell is made out of, but it's not nearly as important as what foam is inside. And most people don't even ask what it is. It's the foam that absorbs the energy of an impact - especially the big ones. 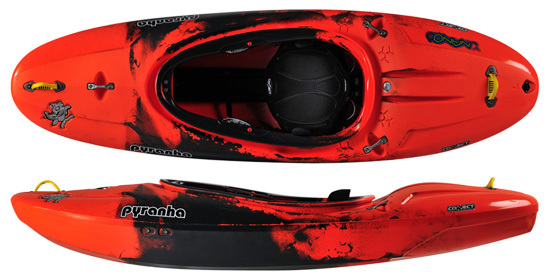 There are different types of foam but all kayak helmets are made to absorb multiple impacts. That means the foam takes a hit and absorbs the energy without permanent deformation. (bike helmets, on the other hand, are designed to take a single impact after which they have lost their ability to absorb energy). Some foams are better than others. The best is EPP (expanded polypropylene). It's got better energy absorption properties than standard minicell (often EPE - Expanded Polyethylene or EVA - Ethylene Vinyl Acetate). And all foams come in different thicknesses and densities. The dense stuff isn't as comfy but it absorbs more energy. Lots of companies either have two layers (a dense outside layer with a thinner, comfier liner) or they have fit pads that are softer to make the fit more comfortable. If you can compress the foam with your hands to touch the shell it is too soft or too thin. And important thing to note is that even though helmets are designed to handle repeated blows, if the impact is large enough it will deform the foam and limit it's ability to handle more blows in the future. BUT YOU CAN'T SEE IT. You may not notice any difference in the foam but if you take a large hit you should think about retiring your helmet even if it looks fine. 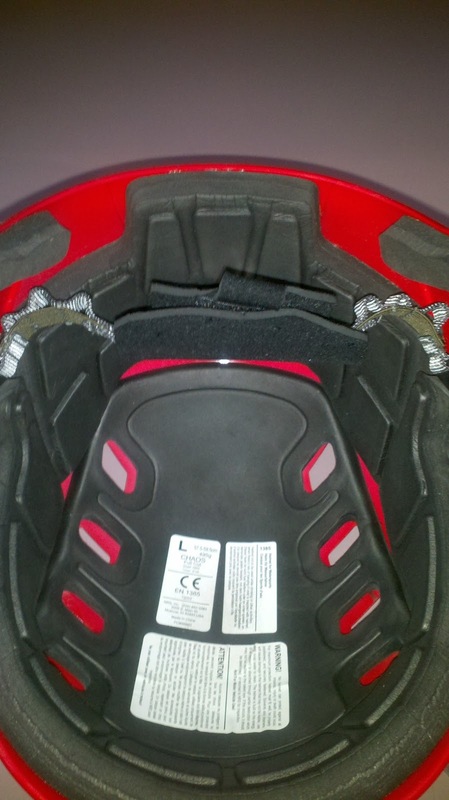 Some people talk about 'repairing' their cracked helmet - even if you do repair the glass shell you can't repair foam. It would need to be replaced. The shell is the least important but the most noticeable thing about a helmet. Carbon fiber is light, stiff and expensive. Does it protect you better than plastic? Maybe. A stiff shell can spread the force of a point impact across more of the foam. That's good if you hit a sharp object. But fiberglass or a stiff plastic will do almost as well as carbon. A soft plastic won't do well at all - you want a helmet, not a piece of tupperware. Another thing of note is shape. Helmets with a large brim (like the Sweet Strutter) can catch current and exert a tremendous force on your neck pushing the helmet back. Not good for surfing - river or ocean. Full face helmets can protect your teeth (and good looks) but can limit your communication. Some people talk about the danger of snagging the front bar of a full face, but I've never heard of it happening. On the other hand, I personally know several paddlers who have lost teeth and so does everyone else. So take your time and put some thought into your helmet. You don't need to spend a ton of money - the most expensive is not always the best or necessary. But start with what fits. Pay attention to what it's made of. And keep in mind what you are going to be using it for. 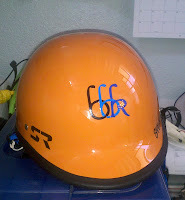 For the record, I use a Shred Ready Shaggy fiberglass helmet for most paddling - teaching, easy whitewater, ocean playing. Good stiff shell, EPP foam, small brim. 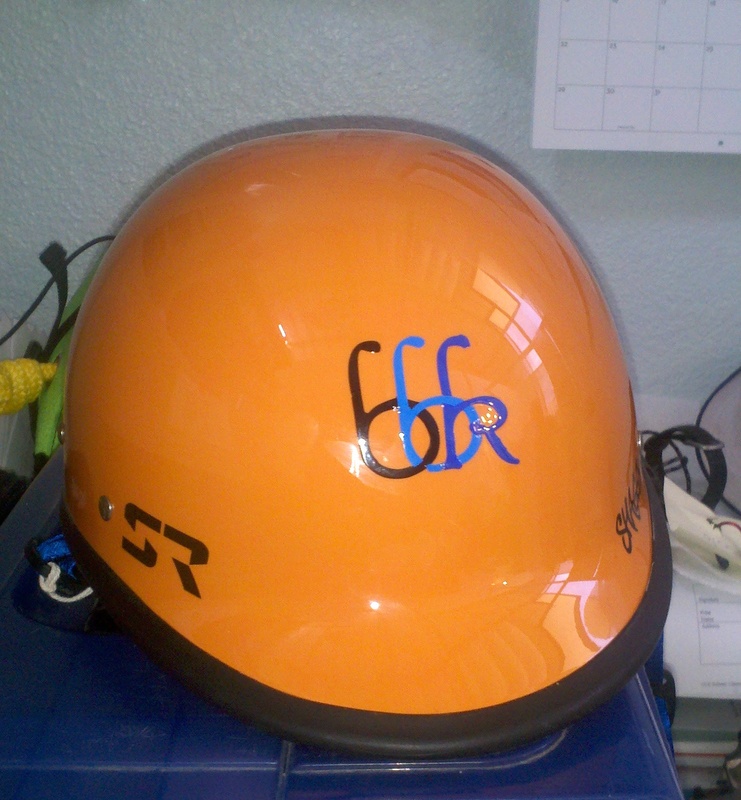 For class IV/V whitewater I use a Sweet Rocker Full Face - carbon shell, full coverage, lots of EPP foam. Since it's a short boat I thought I'd give it a short review (actually, I only paddled it one day on class III so I don't know enough for anything more comprehensive). 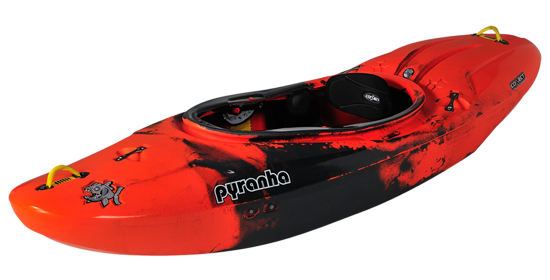 The Pyranha Nano is a creek/play combination. That's not an easy combination and it's not a boat for everyone. Where I think this boat shines is for class V paddlers who want to play their way down easy class V runs - that's a small niche. (video of the Pyranha pros doing just that can be seen here). This boat is a reincarnation of the Ammo (though Pyranha doesn't seem to want to associate the two boats together). The Ammo didn't win over many folks, but I used it a lot to teach out of and liked it for certain things. So I'm going to compare the two boats. The Nano feels short. It turns quickly - spins on its flat hull. But it's got a lot of volume in both the front and the back. The planing hull surfs rather nicely and it cuts back so much easier than a longer river runner. But the weight of the boat (more creekboat-like) slows it down - it's not a playboat on the wave - just a nice surfing river runner. The Ammo had a sharp edge that was fun to carve with - for some reason that Nano edge seems a little harder to engage. This turned out to be a good thing since it made the edges much more forgiving - combined with the volume it gave the Nano a solid stability that felt like a creek boat. The Nano was quick and fit into tiny eddies but handled the waves and funky current like a big boy. The Ammo was also slow. The Nano is surprisingly fast for it's length. It's not as fast as an eight foot creeker, but it's got some speed to it. It also boofs like a champ! The speed, short stern, and just enough rocker allow it to launch off rocks. Couldn't do that so easily in the Ammo. In the end I had a really fun day in the Nano. It's a similar concept to the Ammo but a completely different design. It seems to have improved a lot of the issues with the Ammo while keeping all the fun. Is it the right boat for you? If it is you'll know it. I think it would be great for certain runs but I wouldn't feel comfortable taking it down something that I thought was challenging. And if I was on something easy and wanted to playboat I'd take a playboat. Every time someone tries to come out with the 'one and only' boat you need I always think it ends up being the perfect third boat. But it is nice to see Pyranha doing something a little different and doing it very well. I used to kayak surf a lot. That's when I lived 10 minutes from the ocean. It's two hours away now and with all the whitewater and sea kayaking and teaching and other stuff I just don't get out surfing much. And when I do it seems like it's been in a long boat which really isn't the same. 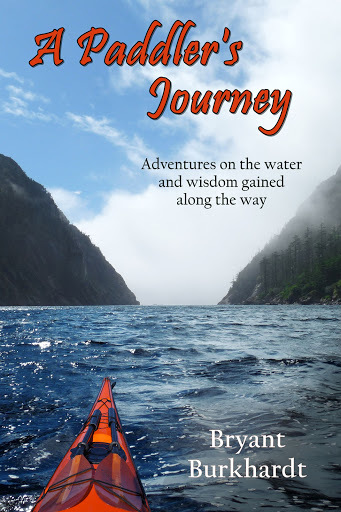 My first kayak was a whitewater boat purchased solely for surfing and I learned so much that way. It's something I miss but not so much that I do anything about it. And lately when I have found myself in the waves it's been a little frustrating - I can't read things as well as I used to, I don't have the timing or the rhythm. I've gotten exploded a couple times in the past year in sea kayaks. Lost some sunglasses, almost lost half a paddle. All from poor judgment. But recently that all changed. I found myself passing through Ft. Bragg on the Mendocino coast. My friends Jeff and Cate had the day free and took me out to a new spot. They also loaned me a whitewater boat - the ever reliable Necky Jive. It was warm and sunny and hardly a soul in sight. The perfect surf session. And I found my rhythm again. The waves were decent but hard to find the takeoff spot. They broke left and right and closed out quickly if you didn't get enough speed. They weren't huge but they had some power behind them. It took a little but I started picking my spots. I felt strong when accelerating to catch the shoulder. I was able to link some turns and felt the pure joy that is riding a wave. That's what I was missing and I'm so glad I found it again. Thanks Jeff and Cate! Here's a little video from the day - it's all helmet cam stuff so it doesn't do the waves justice. But I had to speed it up to fit in all the rides - actually I only fit in half the rides. And you'll want to stay tuned for the surprise ending.